Shredder Chess is a classic iPhone app that lets you play this chess. 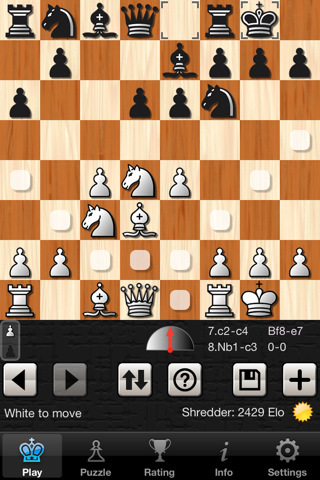 The Shredder Chess app loads fast and plays fast as well. Touching any cell highlights you your possible moves. Informational messages appear on the bottom of the board as you play. You can also use drag and drop. The board design is slick and you play in top-view. You play against the Shredder Chess computer. The game has a very strong playing ability and human like logic and characteristics such as human-like errors. With Shredder chess there are one thousand games built in and you can adjust the strength from beginner to master. You can ask for advice from the AI, which knows your skill level based on your past performance, and view how are getting better as you play. You can also set the game to adjust its strength to your level based on your calculated Elo rating. The game even has support for voiceover. Shredder Chess has no online multiplayer support. A player vs. player mode has been added. The price of the app at eight dollars is a bit high but about average for highly developed chess games. Side note: Shredder Computer Chess has been available for the PC and MAC for a while. AppSafari review of Shredder Chess was written by Joe Seifi on October 16th, 2009 and categorized under App Store, Board, Featured, Fun, Games, Puzzler. Page viewed 5961 times, 1 so far today. Need help on using these apps? Please read the Help Page.